August is a great month here in Kansas. Can you spell H-O-T? I love the dog days of summer. The cool mornings, bright sunny afternoons, and the clear warm evenings. I am a summer junkie! Of course I am typing this from the comfort of my air conditioned house (ok, wimp wimp wimp), but I still love summer. 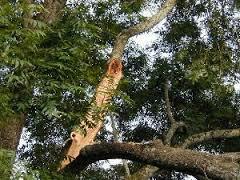 We had a big thunderstorm a few nights ago and the top of the maple tree in our back yard went crashing to the ground! I call it our self-pruning maple tree because every year a branch comes down in one storm or another. Pretty soon there won't be any tree left! It is a very temperamental tree! The August Seminole Sampler row is now posted on my 2016 BOM page. You can download the pattern file for free during august. I love this row. I call it Floating Windows. 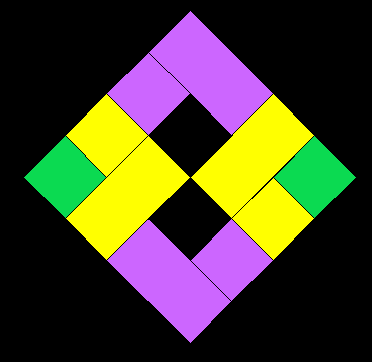 It looks like little black windows peeking out from the yellow and purple squares. If you subscribe to my newsletter, you will also receive the free bonus block which accompanies this row. No surprise to anyone, it is also called Floating Windows. This month in my newsletter I am offering two different half price patterns and offering all 7 of the current bonus blocks for $6.00 for the set. Check those out HERE. If you are not a subscriber it is easy to do. Just fill in the little form with your name and email. You will not get any junk mail, only 2 newsletters a month, and you can do a one-click unsub anytime you no longer wish to receive it. I am catching up on "stuff" now that I have a bit of down time from traveling. I do love meeting with guild members, students, and other professionals when I teach and vend, but this month I am enjoying being home, watching the grand babies (6 months and 2-1/2 years!!! ), and working on some new designs. I have a boat load of new patterns coming out this fall and that means lots of writing. I do enjoy that part of the design process but I sure need a good editor. My thanks to "Threadlady" Judy who edited my Seminole Sampler pattern for me this month! You rock!!!! I love it! Thank You so much for this block of the month. You have expanded my horizons greatly. I had no idea what a Seminole quilt was before this began. I feel so grateful and humbled by this gift you have given. Thank You! Your tree trimming idea is hilarious!